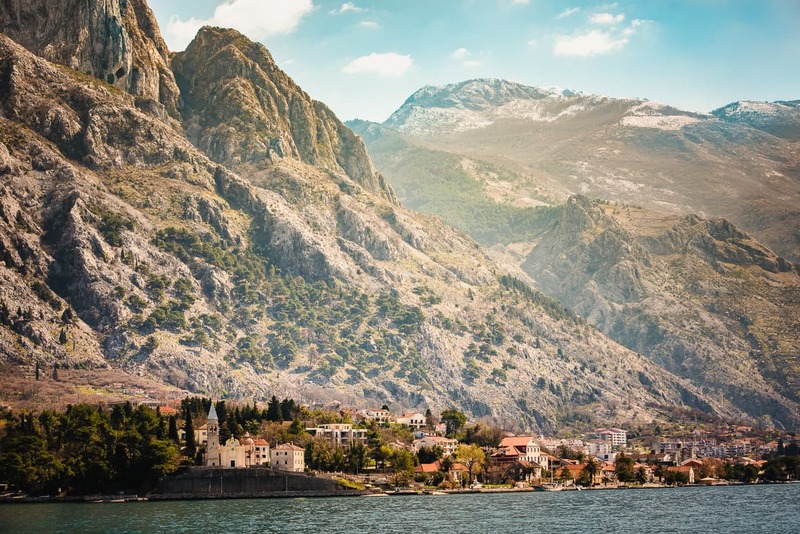 If you visit Kotor, Montenegro there’s no escaping the fact that the Bay of Kotor is the scenic gem of the region. As beautiful as the Old Town is, or the mountains in the background. That sparkling blue water just keeps stealing the show. We spent the entire month of March in Kotor, so we had plenty of time to figure out how we wanted to explore. 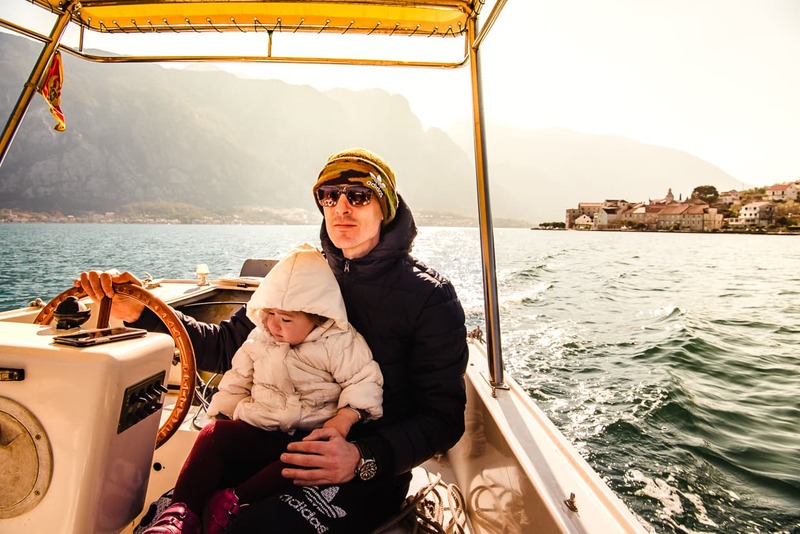 One of the best things we did was hire a boat to take us on a day trip to Our Lady of the Rocks and Perast. 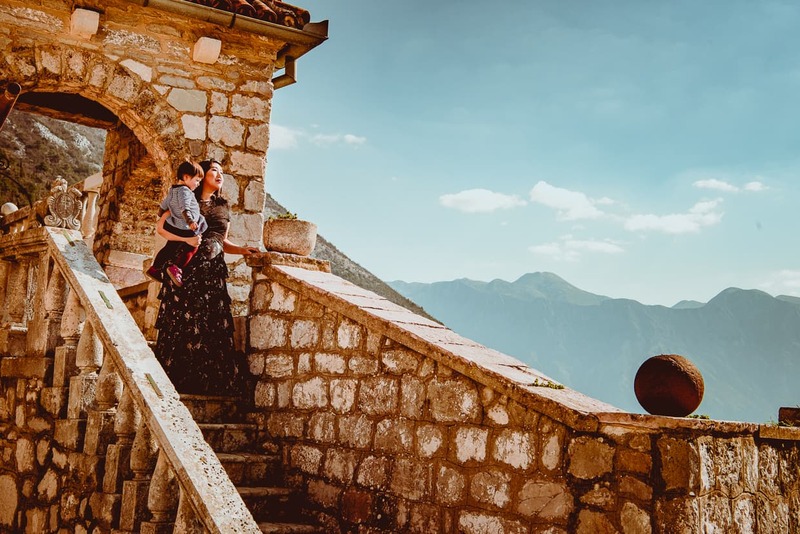 If you don’t have time for a whole boat tour, but you want some great photos of the Bay of Kotor, consider checking out the great views we got from this hike over the Old Town, or this cool walking on water photo shoot we did. By the way, this article contains affiliate links. 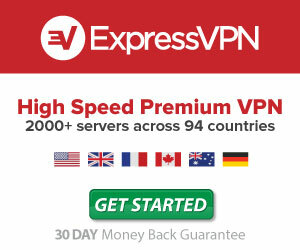 If you click on one and make a purchase, we will earn a small commission at no extra cost to you. These commissions help support our travels and this website. What is Our Lady of the Rocks? Our Lady of the Rocks, photographed from Perat, Montenegro. Our Lady of the Rocks (Google Maps) is unique in the Bay of Kotor, as it is the only man made island. 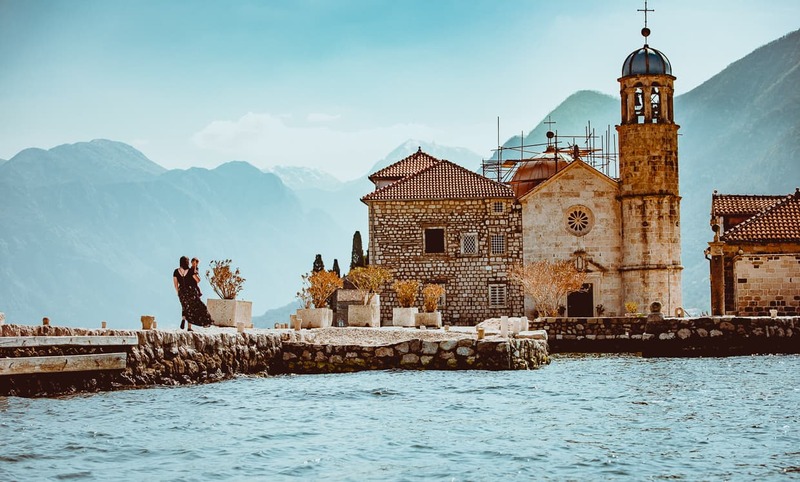 It was built over hundreds of years by the people of Perast, Montenegro dropping rocks into the water from ships. After an image of the Virgin Mary was found on a stone there, they accelerate the process by sinking ships full of stones, and eventually constructing a platform and the famous Church of Our Lady of the Rocks. 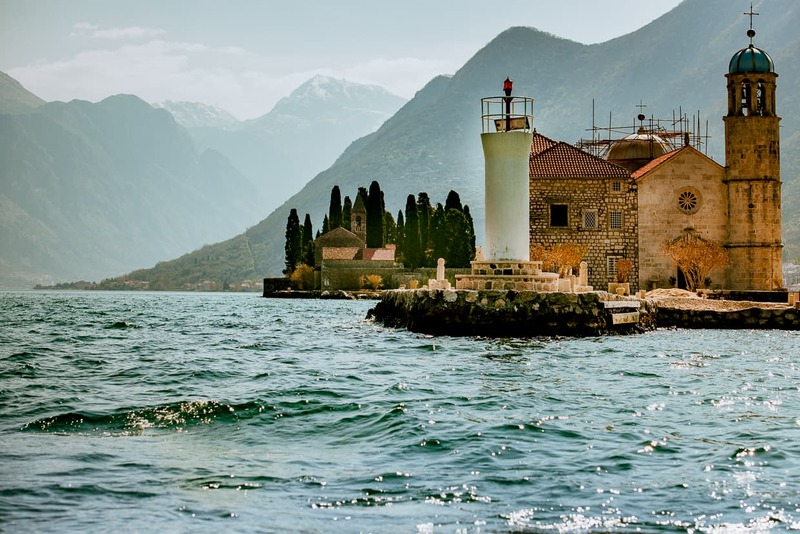 Perast, Montenegro (Google Maps) is a small village on the Bay of Kotor, several kilometers to the North of Kotor. It has a population of less than 300 today, but it was once several times larger, centuries ago when it was still an active port town. Perast, Montenegro, in March, 2017. 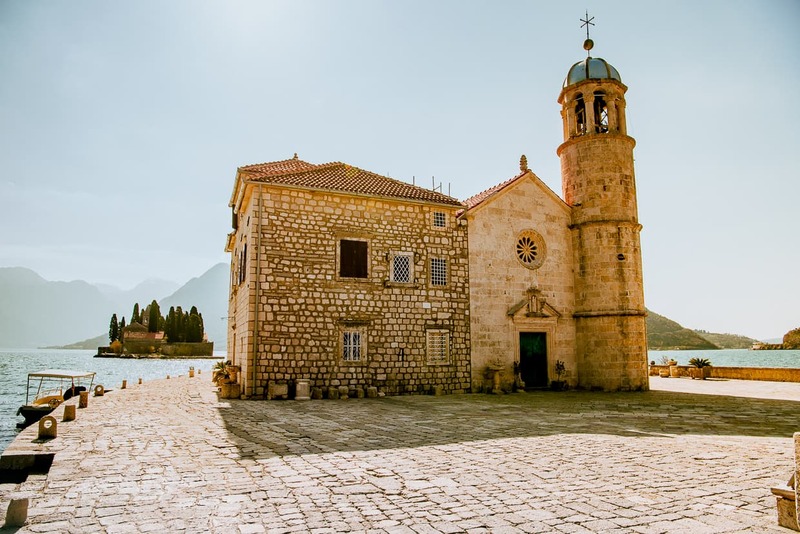 Perast is best known for its towers and churches. 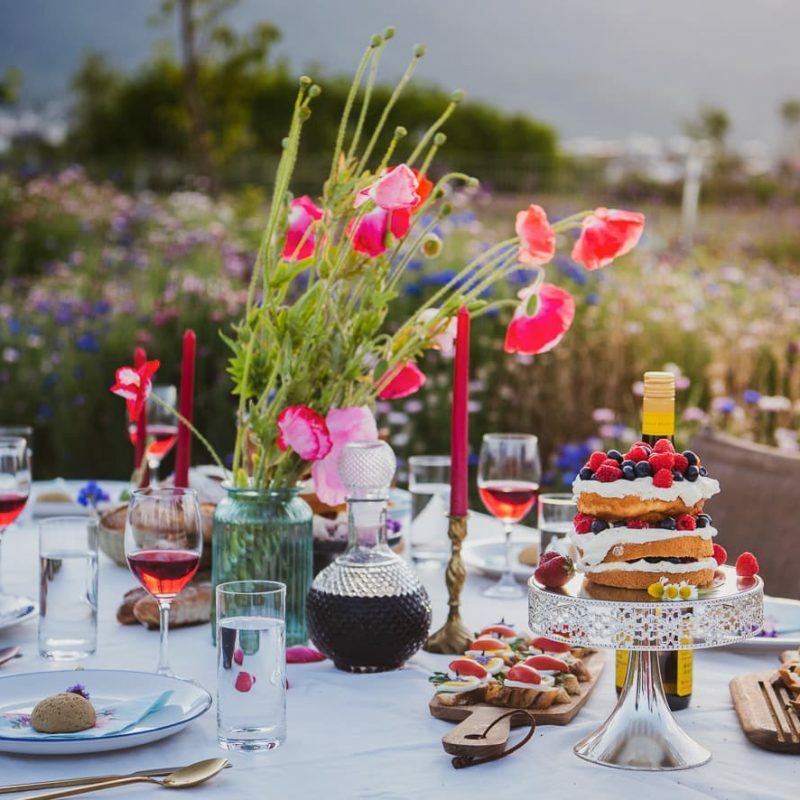 Tourism is the main industry these days, and it is home to a number of hotels and restaurants. 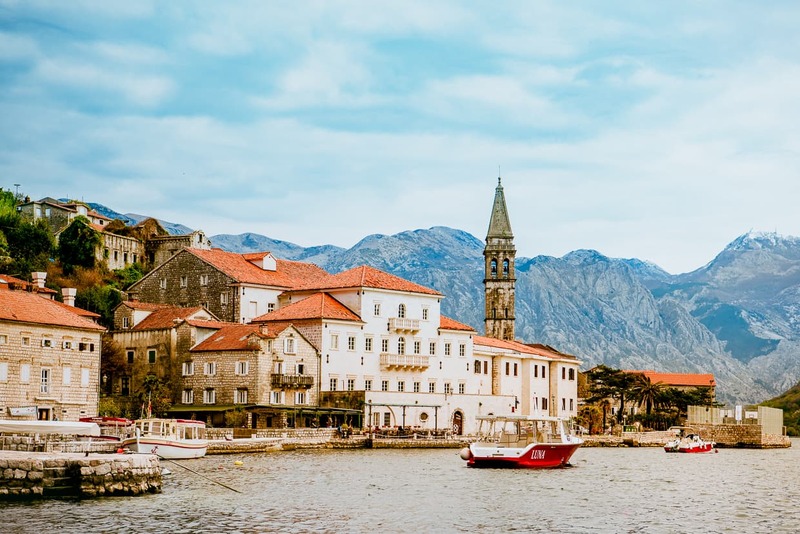 Though during our visit in March, most of the businesses were closed, unlike in nearby Kotor, which is large and popular enough to remain somewhat vibrant, even during the off season. 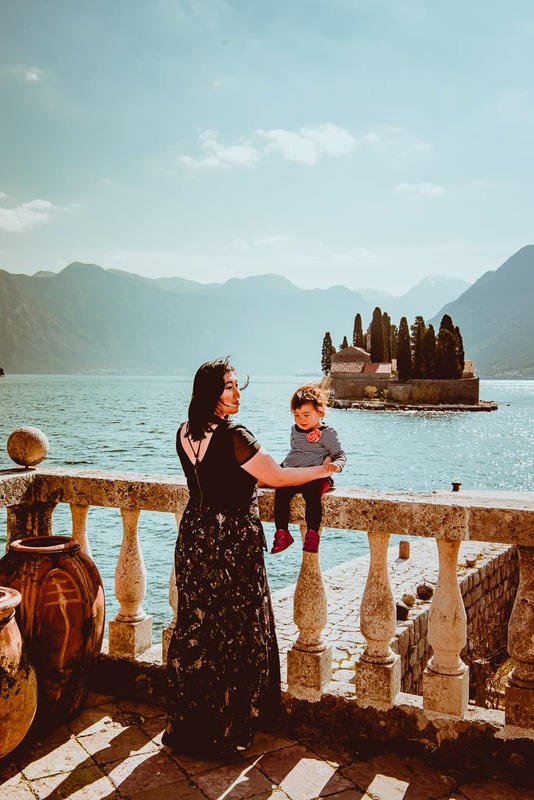 During our stay in Kotor, we made one trip to the island of Our Lady of the Rocks and three trips to Perast. 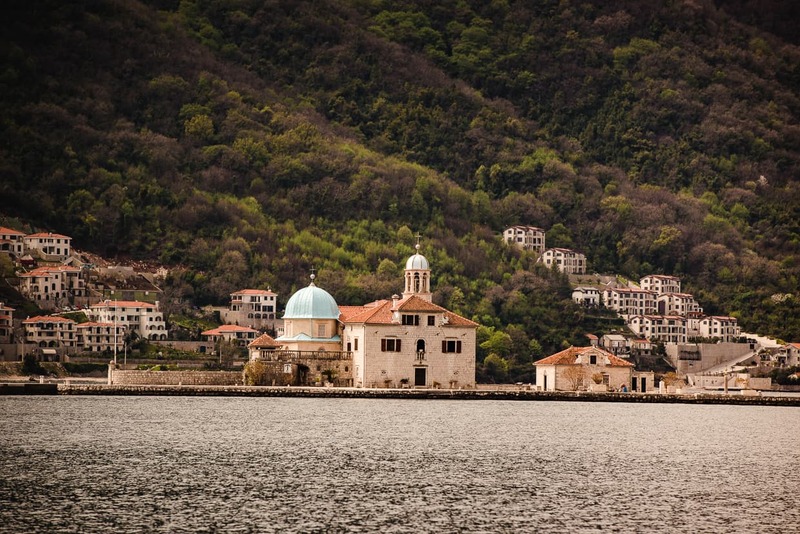 One of our Perast visits was by boat tour from Kotor, coupled with Our Lady of the Rocks. Our other two trips to Perast were via bus. One of them was ruined by weather, the other was ruined by toddler vomit. 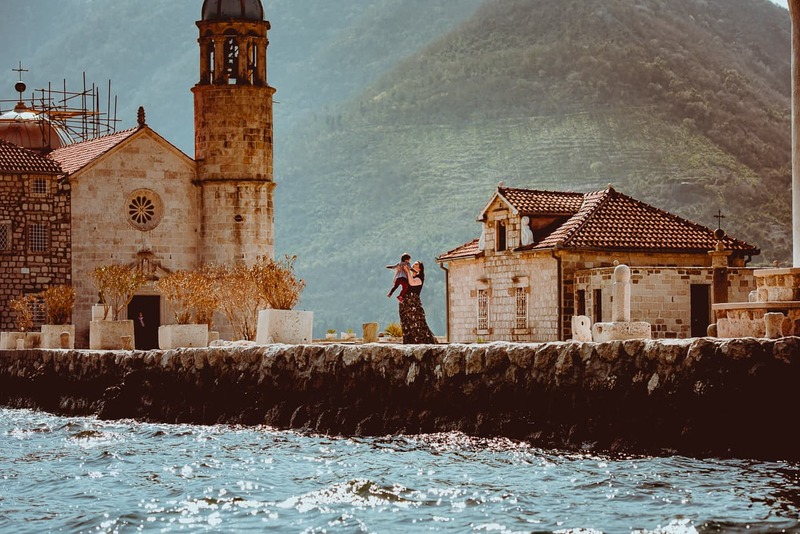 As with much of our travels, our focus for day trips to Our Lady of the Rocks and Perast was on photography – specifically our mission to get fun images of Lisa and Dannie together, exploring some of the most beautiful places in the world (hence our visit to the Bay of Kotor. Anyway, here’s how we did our exploring, how we liked it, and what we saw. 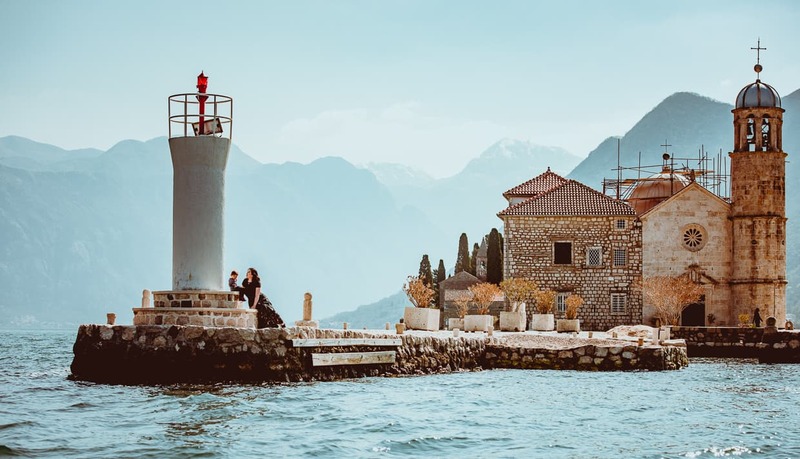 When we were researching online how to get a boat to Our Lady of the Rocks, the most common advice was just to go to the waterfront of Perast and hitch a cheap ride from one of the boat captains along the waterfront promenade. Having visited Perast by bus just a day earlier, we knew that this wasn’t going to work. There just weren’t any boat captains along the waterfront in early March. So we decided to ask for help at the Kotor tourism kiosk (Google Maps) outside the city walls of the Kotor Old Town. Normally we don’t find tourism centers to be very enjoyable (we’re more the walk around looking type), but we enjoyed chatting with the woman inside. It was a bit slow at the time, and I think she was happy to have someone she could help. She helped us to contact a boat captain, and we made arrangements for the the next morning with a good forecast. Our Lady of the Rocks is a good distance from Kotor (about 45 minutes by boat), and it wasn’t cheap. The boat was capable of carrying several more people, but we weren’t sharing it with anyone. I can’t remember the exact price, but I’m pretty sure it was 50 – 75 euros for the whole day. We did however, get what we paid for. 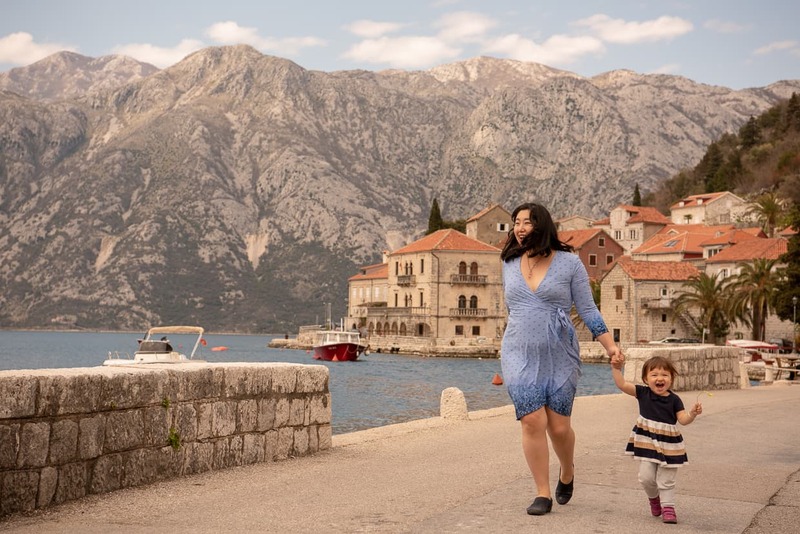 The trip was one of the highlights of our time in Montenegro. It seemed like every little village we passed in the Bay of Kotor had at least one huge beautiful stone church. 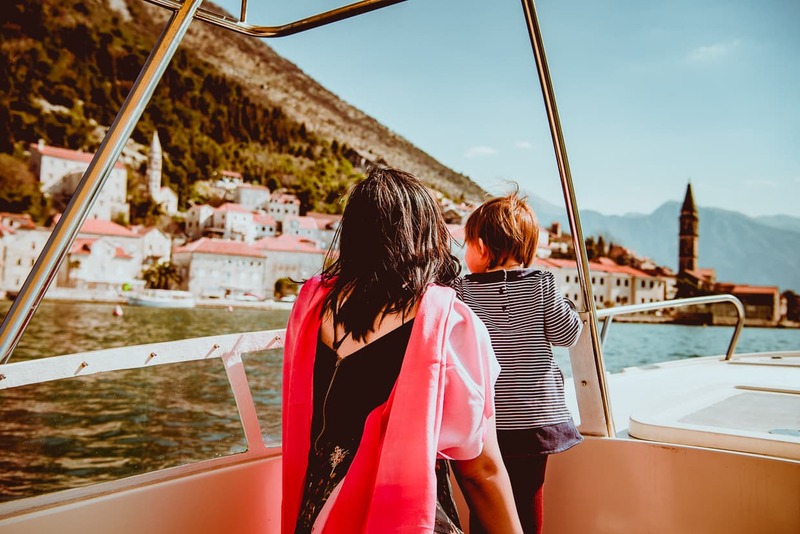 Even if you are there in the Summer and boats from Perast are available, we didn’t really like taking the bus to Perast from Kotor, so the extra money might be worth it. 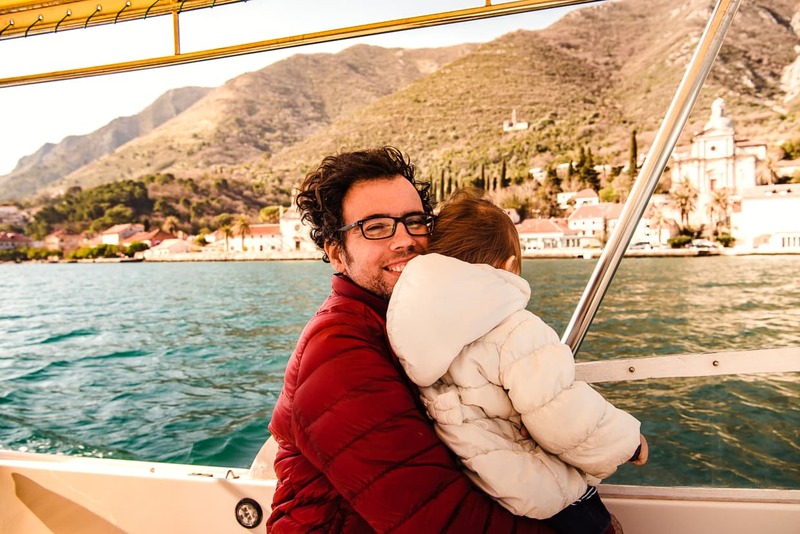 If you’re excited about getting some great photos and taking in some great scenery on your trip to the bay of Kotor, a boat ride is an amazing and fun option. 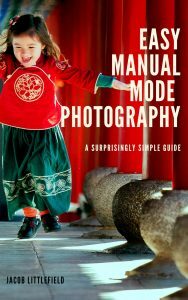 If you want to make sure your photos come out the way you imagine them, it might help to have a look at my new e-book, Easy Manual Mode Photography, which is available in our shop. We actually wound up being happy that we couldn’t find a boat from Perast in March. 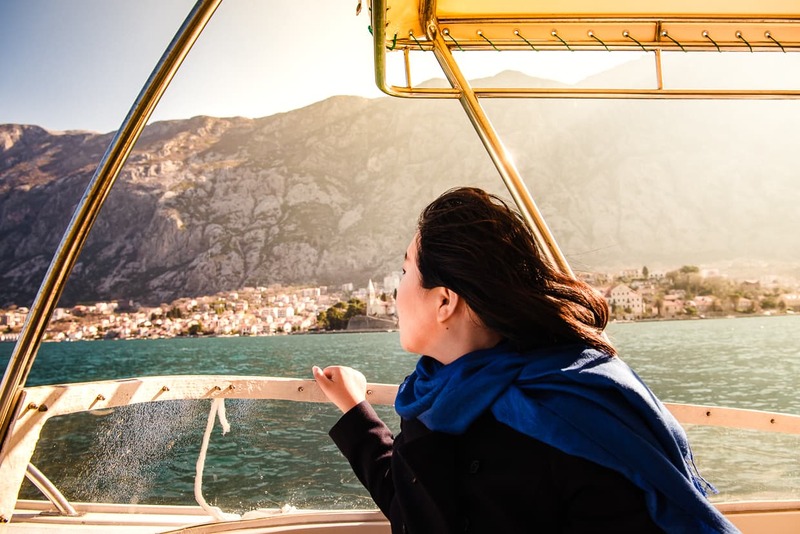 Traveling by Boat across the Bay of Kotor was an incredible experience. The mountains and cliffs rise up straight out of the water in such a way that it is often compared to the fjords. The views of the bay from Kotor are lovely, but they were bested by what we saw from right on the water. As we were navigating the bay, we explained to our captain, who spoke English pretty well, that I wanted to take pictures of Dannie and Lisa on the island from the boat. He told us that that would be no problem, he would pick us up and drop us off wherever we wanted, as many times as we wanted for the duration of our tour. The first thing we asked him to do was circle the island once so we could see what all the angles would look like. Read our article on the value of scouting before a photo shoot. After we had walked around the Our Lady of the Rocks for a little bit, I talked to Dannie about a few places where we wanted her and Lisa to pose for photos, and I climbed back into the boat with my camera. The boat captain took me back out on the water and helpfully carried me back and forth, in and out, until I had all the angles and compositions I wanted. I then returned to continue exploring with Lisa. 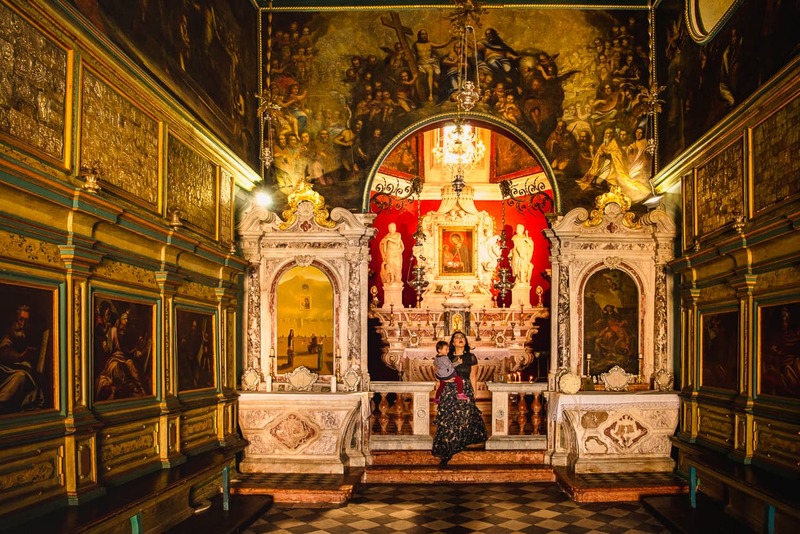 The most popular location for photographing the island of Our Lady of the Rocks is from Perast, which makes sense because it is the most accessible. The island is visible from the waterfront promenade (Google Street View), but it can be hard to create separation between the island and the mainland behind it. While we were circling the island in the boat we were able to make it more clear that Our Lady of the Rocks was a separate land mass. Once you are on the island itself, though, the scenery gets a little more dynamic. We were lucky that during the off season we were alone out there for most of the time. During the busy season, the tour boats stop frequently, and it’s likely much harder to get a photo that isn’t crowded with tourists. No crowds on Our Lady of the Rocks in March. In fact, at one point a tour boat full of Chinese tourists landed and began wandering around blocking up our shots. We were worried that they were going to ruin our photo shoot (like similar tours made our lives difficult on the Charles Bridge in Prague), but they only stayed for about 10 minutes before piling back onto their boat and leaving. I can’t imagine they had a very enriching experience. Our captain told us we couldn’t go to the nearby Island of St. George (Google Maps) because it was a cemetery and it was closed to tourists. That was a shame, but it certainly made a good background for a lot of our photos. The Island of St. George. We spent a lot of time on the southern side of the island, behind the church, taking photos of Lisa playing on the stony platform. The nice thing about this area was that it was big enough that Dannie didn’t have to worry constantly about our toddler’s safety near the water, and there were low stone walls with big stone spheres to keep here occupied and add to the foreground in our photos. On the other end of the little island there was a long pier with a lighthouse on the end. The lighthouse itself wasn’t particularly photogenic, but it was a great place to create separation between the subject and the camera, and the pier jutting out into the Bay of Kotor was perfect for getting a lot of water and waves into the frame (it was a windy day and the water was quite choppy). This location was especially attractive when taking photos of Dannie and Lisa from the boat. I used our 70-200mm lens to zoom in and compress the distance between them and he church in the background (read our article about using a zoom lens for creative travel photography). Doing this also made the mountains in the background look closer and more dramatic than they would have if I’d shot it from close up with a wide angle lens. As you can imagine it was hard to keep the camera level while zooming in on a rocking boat, but I took enough photos that we came away with plenty of lovely shots. Luckily I had plenty of SD cards with me. If you walk around to the southeastern side of the island, you’ll see a stone staircase that goes up to the top of one of the buildings. Even though the staircase isn’t obviously in a special location like an island in the Adriatic, it is very photogenic and I couldn’t help but take a picture of Dannie and Lisa on the steps while we were exploring. The Church of Our Lady of the Rocks is a small but beautiful domed church that was built on the island in the 15th century and renovated in 1722. 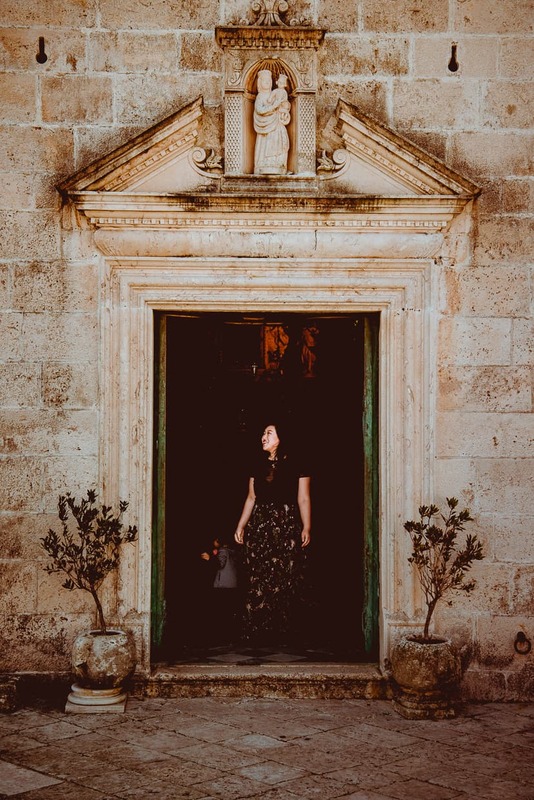 It’s the largest and most beautiful structure on the island, and visitors are allowed to enter to see the baroque decorations and beautiful artwork inside. The Church of Our Lady of the Rocks. It’s worth noting that this is a real, active church and not just a monument for tourists’ entertainment. The whole island is a religious site, and it’s important to dress and behave appropriately while you are there, less you draw the ire of the church’s caretakers and worshipers. Use your best judgement about what is respectful, but wear at least a tee shirt. Inside the church, we bought a candle to place at the alter. We aren’t religious, but since we were enjoying the church it seemed like helping to support it was the right thing to do. Lisa didn’t want to put the candle down, so we let her carry it around the island for a little while (you can see it in some of the photos), but before we left, we encouraged her to go back inside and put it where it belonged. She put it on the alter of her own free will, which was pretty impressive for a one year old. The interior of the Church of Our Lady of the Rocks. 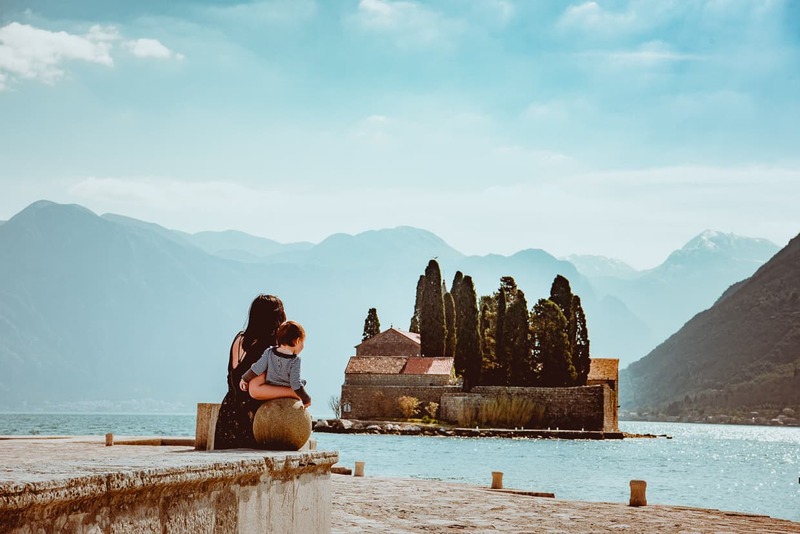 Early in our month in Montenegro, well before our boat tour of the Bay of Kotor, we decided to catch a bus to Perast from the Kotor Old Town. The blue line bus starts from the main bus station (Google Maps), but it conveniently stopped right outside the city walls, south of the main gate. Reports of the frequency and reliability of the bus vary, and I think that’s because people visit at different times of the year. While we were there in March, during the off season, it seemed to come by once an hour or so. Unfortunately, once we were in Perast, it wasn’t nearly so reliable. Both times we visited by bus, we wound up waiting a long time for our ride back to Kotor. One time, we even missed it when we stepped away from the bus stop for just two minutes to buy a bottle of water. It was still better than the ridiculously inaccurate bus schedule for our day trip to Cavtat from Dubrovnik, Croatia. Part of the problem is that the Perast bus stops for the outgoing trip and the return trip are in different locations. On the way to Perast from Kotor, you will be dropped off on the side of the highway on a hill over the village and you have to make your own way down into town. 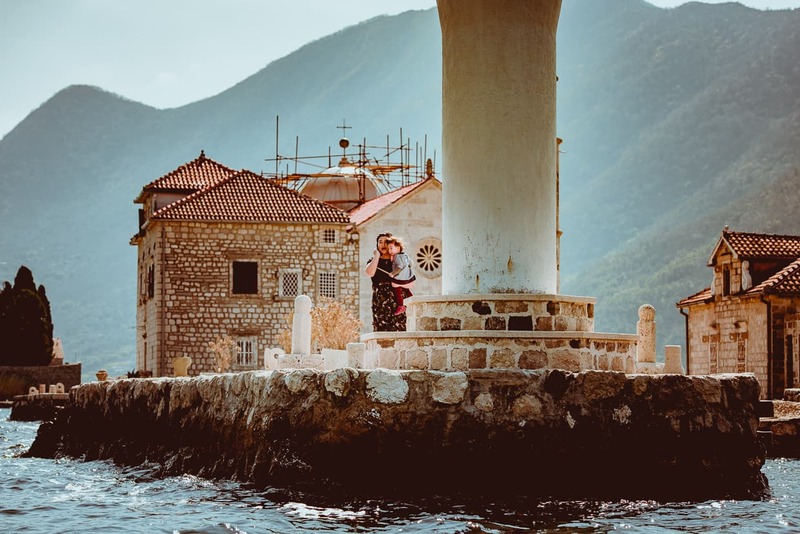 When you return to Kotor from Perast, there is a bus stop down near the Perast Promenade (it can be hard to locate because it does not appear on google maps, but here is a Street View image of it, so you can locate it by the stripy poll and the tower nearby). If you get motion sick like Lisa does, then the bus ride might not be for you. The road is very curvy and bumpy, the shocks on the bus are inadequate, and they drive pretty fast. Lisa barfed repeatedly on one of our trips. As a point of reference, she had no trouble on the waves when we took the boat. If you are visiting Perast from Kotor, the “bus stop” is next to these stairs (Google Street View), that you must walk down to get to the interesting parts of town. The stairs are a bit treacherous, and not at all stroller friendly, but they do provide some nice scenery on the way down. 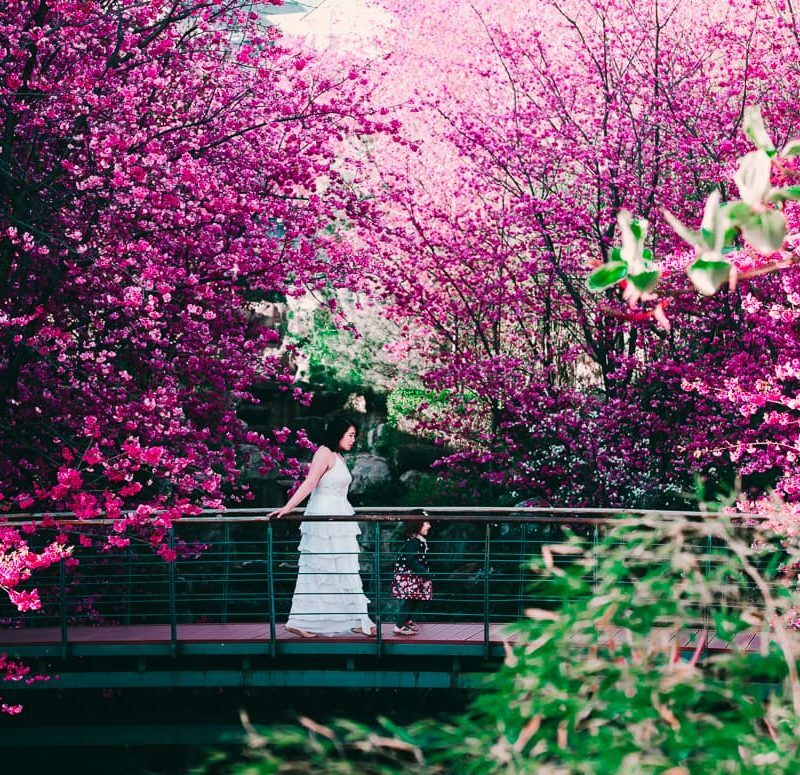 If you absolutely cannot handle the stairs, you could walk about a kilometer north up the highway to where the road along the waterfront promenade intersects with the highway, but you would be missing out on the scenery. 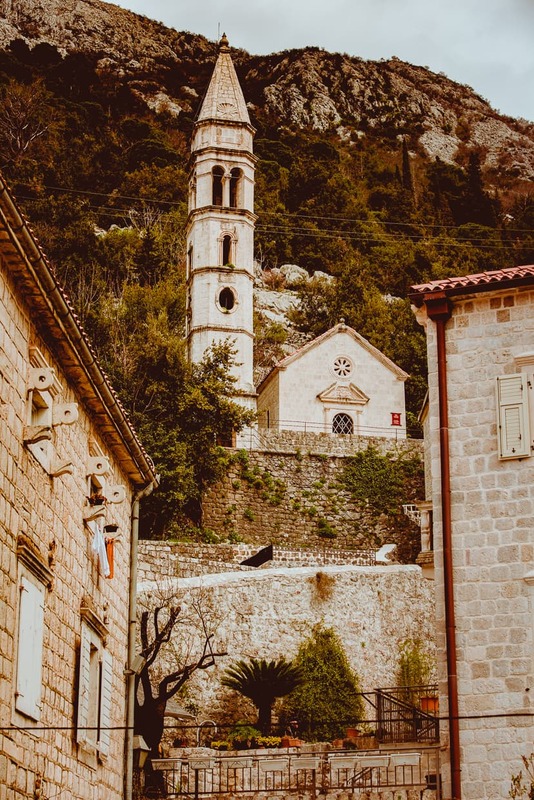 The steeple of the Church of St. Nikola in Perast, Montenegro. Taken from near the stairs. 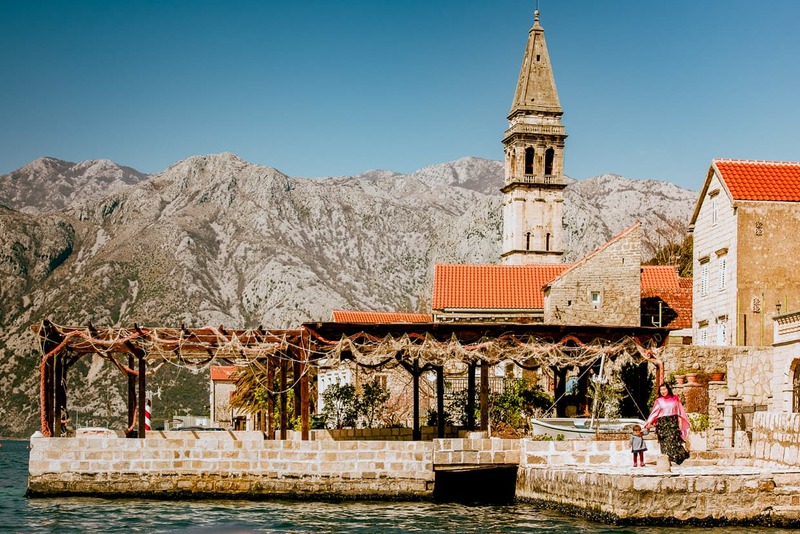 The waterfront promenade of Perast is a beautiful place for a stroll. We had just spent the month of February in Split, Croatia where we walked on the Split promenade every day, and though this one wasn’t nearly as grand, it was still very relaxing. Unfortunately, most of the shops and restaurants were closed for the season, as were some of the museums. But we could still walk around and admire the architecture. At this point, Lisa was obsessed with boats, so she got a kick out of looking at them. Unfortunately we couldn’t stay long because the lack of dining in March meant that lunch was hard to come by (especially for vegetarians). So both of our trips by bus were cut short. Even though we didn’t stay long during our boat tour, Dannie and Lisa did disembark briefly so that I could take some photos of them with the iconic tower of St. Nikola Church in the background. I had them stand on this platform just to the south of the Admiral restaurant (Google Maps) which was closed during our visit. Ok, so full confession, we didn’t work that hard on getting photos of all the cool buildings in Perast. Because it was cold and windy (and one time we were wet with baby puke), we didn’t really hang out very long or get excited about taking photos from the ground. The churches did look beautiful from the outside, but we think it would have been a lot more enjoyable in the Summer. 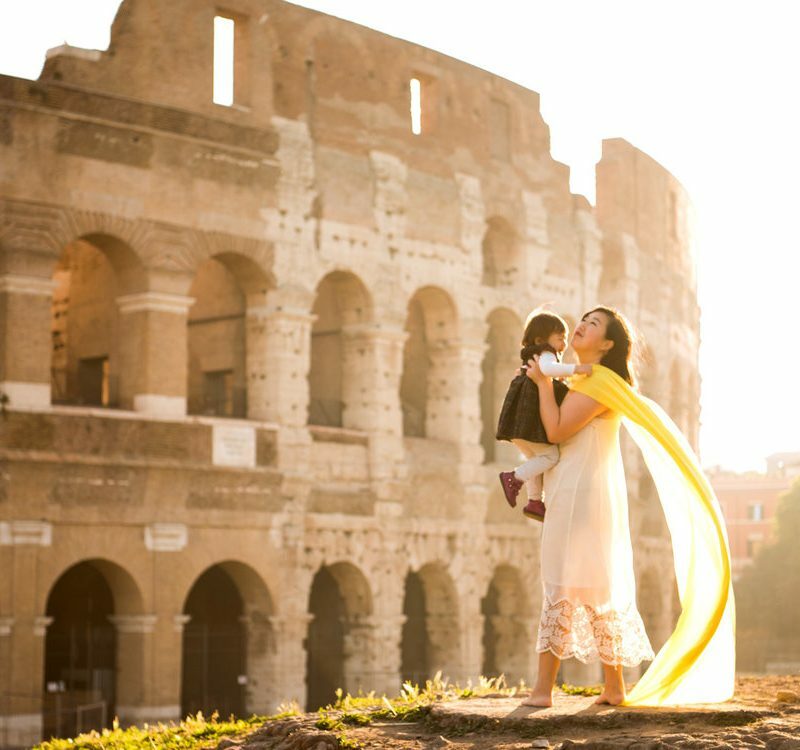 If you the conditions are right for your family’s comfort when you visit, there is a lot of scenery. Old stone stairways, tall towers of white stone, and palm trees standing tall against the brilliant water of the Bay of Kotor. If we had been there during the warmer months, we definitely would have tried to get there early in the morning once or twice for some more interesting photos. 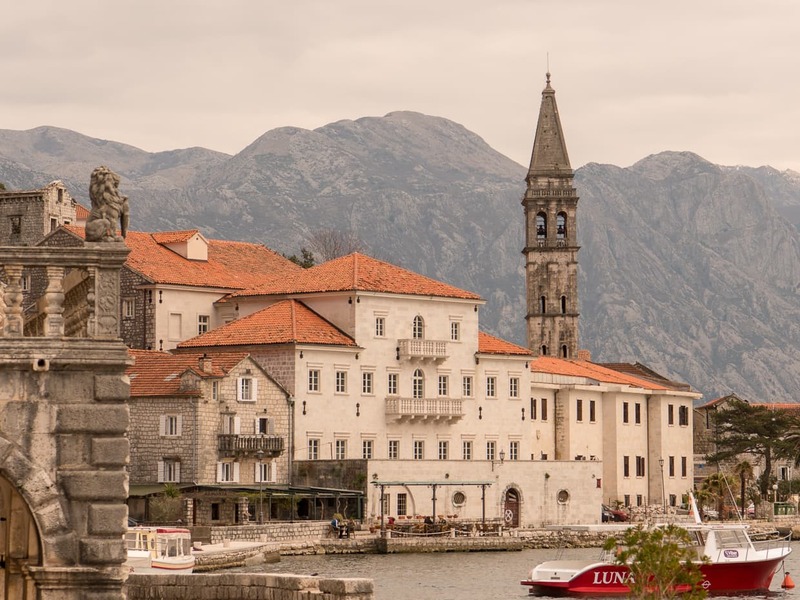 Our boat tour of Our Lady of the Rocks and Perast was our favorite day trip from Kotor. 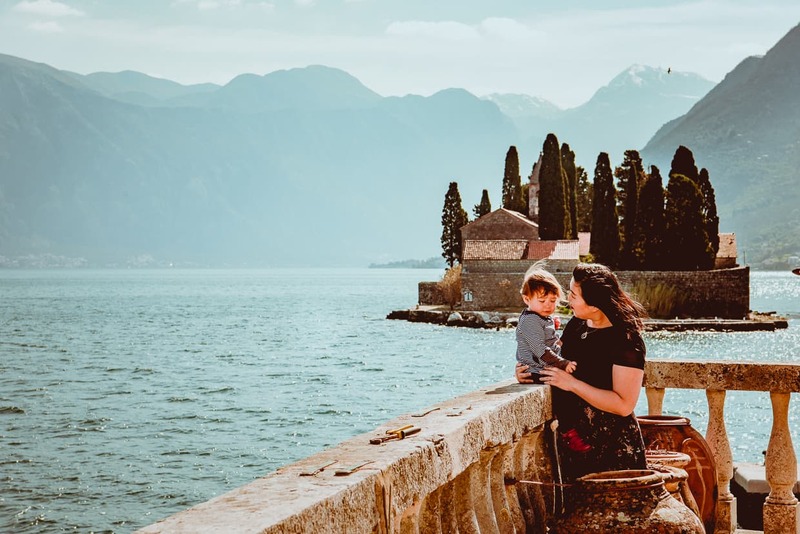 The fact that a lot of the businesses in Perast were closed, didn’t conceal the inherent beauty of the town, or the breathtaking landscapes that surrounded it. 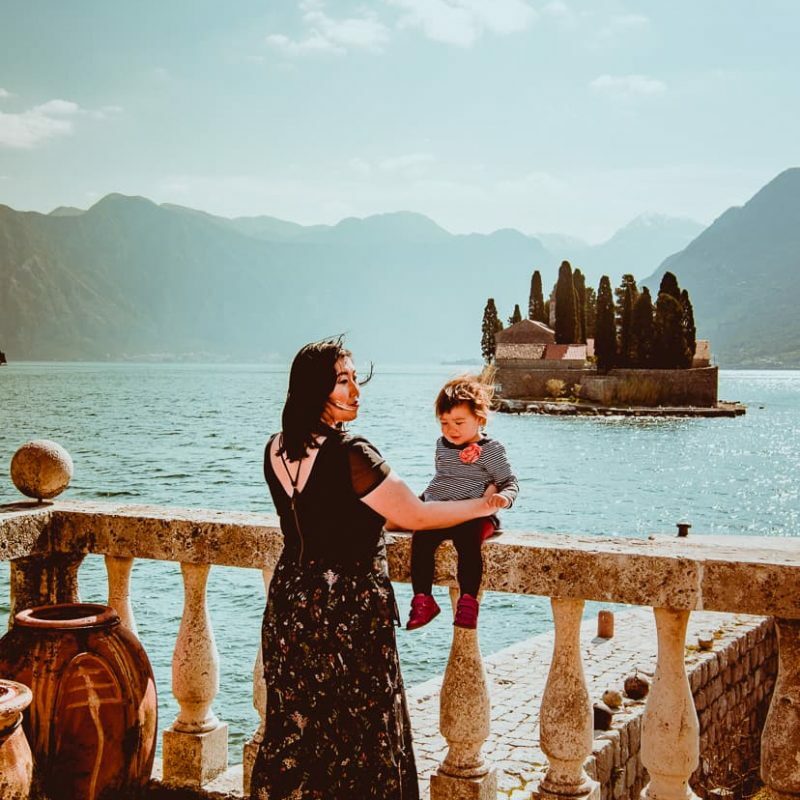 The Bay of Kotor is one of the most photogenic places we have visited, and seeing it from the water was exciting for Lisa, fun for Dannie and me, and a great change in perspective for the whole family. We don’t often recommend tours, especially for families with small children, but this felt a lot more like hiring a private driver than being dragged around from place to place. 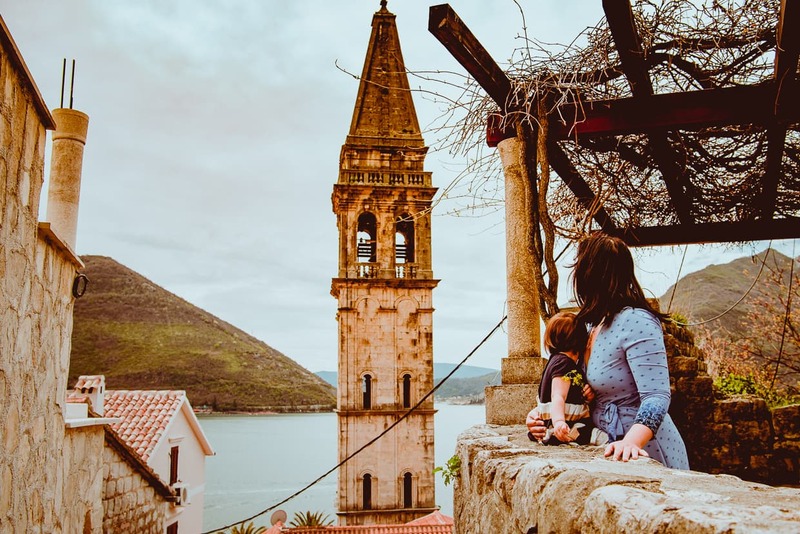 If you found this article helpful, you might want to check out some the other beautiful places we’ve been in the region, like Dubrovnik, and Split, Croatia. 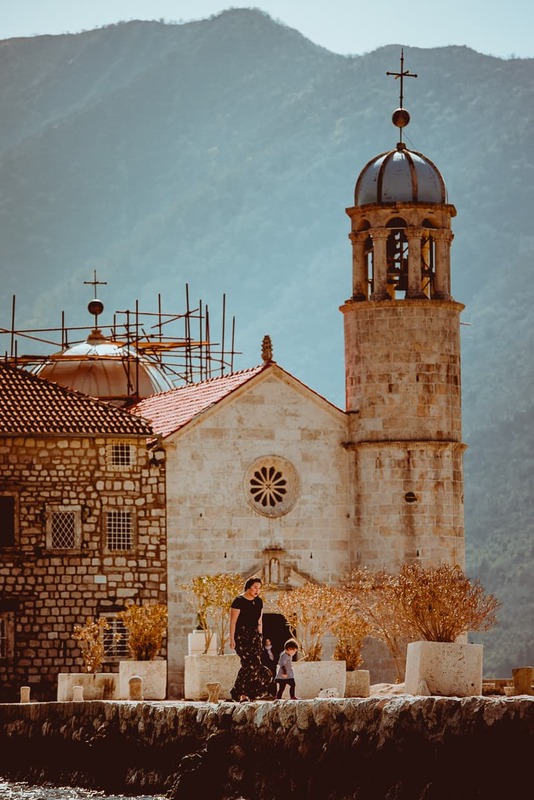 If you have any questions about visiting or photographing either Perast or Our Lady of the Rocks (or anything else in the Kotor area), go ahead and ask in the comments. If you just like touring by boat, we also have articles about day trips to the islands of Murano, Burano and Torcello near Venice, Italy. We often get a pretty good conversation going down there, so even if we don’t have an answer, someone else who visited might. Thanks for reading, and happy travels.